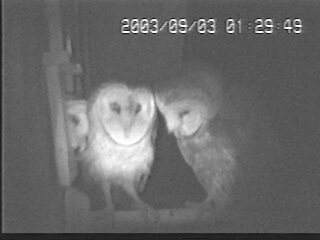 Barns owls have returned to our yard this year to nest in the new owl box on the barn wall. After many years of continuous nesting, the barn owls were apparently eaten by our resident great horned owls. After two years with no barn owls, this pair have successfully eluded the horned owls by being very quiet. I wasn't even aware they were here and using the owl box until I checked the box in late June and found the female incubating her first 3 eggs. A 3/8" peep hole in the box allowed me to check inside without revealing myself to its occupants. The owls also begin feeding quite late, often hunting only in a three hour period from 11 or 12pm until 2 or 3am. Previous owls had often left their day roost shortly after sunset. Limiting their hunting time may reduce their risk of detection by the horned owls. 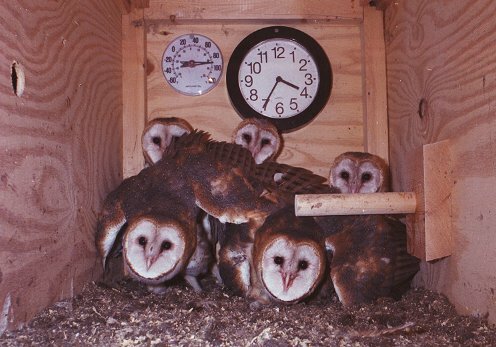 While the adults have remained unusually quiet during all phases of this nesting, the young, who are now leaving the nest each night, and, all but one roosting outside during the day, have been as vocal as previous broods. They perch on the barn gutter or even the peak and call for the adults to feed them. Earlier in the season, a great horned owl was observed perched on the peak of the barn roof, but perhaps this unusually late nesting will find the larger owls occupied with other types of prey. 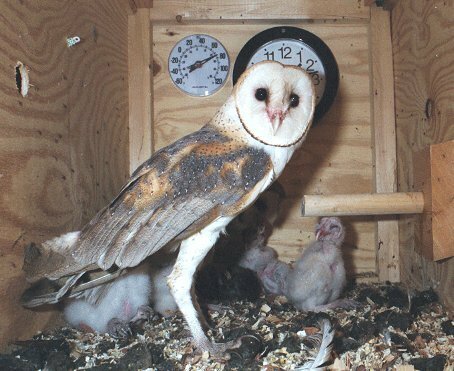 This barn owl nest box is mounted on the interior barn wall with the entrance through the wall. It is of a quite different design than my previous boxes or the dimensions usually recommended in the literature. 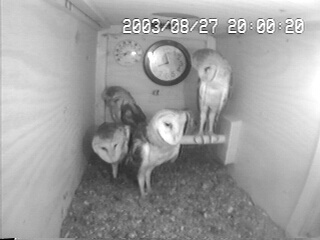 Previous nestbox video of barn owls (the 1994 attic box) demonstrated that older nestlings are quite crowded in conventional boxes, limiting the amount of exercising and wing stretching that is possible. 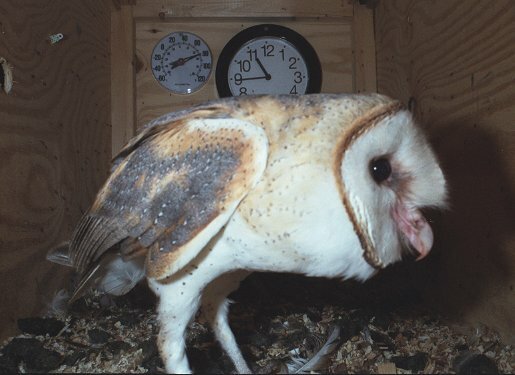 Also, the presence of great horned owls and their previous predation on fledgling barn owls suggested that they might discover the nest box and reach into a small box to grab the nestlings. The new nestbox is 40" long, with the entrance near one end. so even with 5 large nestlings in the box, there is ample room for all to move back far away from the entrance if threatened. As expected, the female laid her eggs at the far end of the box, away from the entrance. The young also remained in this location until they were almost ready to venture outside. The entrance is smaller than usual - 4 1/2" wide by 5" high, also to thwart great horned owls. This small entrance proved to be no obstacle to the barn owls who readily accepted the box and had no problem entering and exiting. 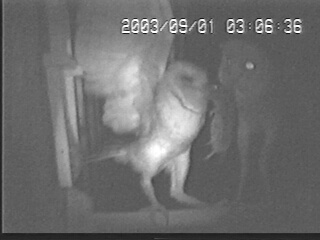 A perch was provided on the outside of the entrance to make the nest site more noticeable to barn owls, since they would likely use it as a hunting perch and then discover the entrance. While I had reservations about fitting the outside perch because of the horned owls, it has proven to be useful both for the adults and nestlings. The nestlings use the perch when they first venture out and also easily land on it when attempting to return to the box. 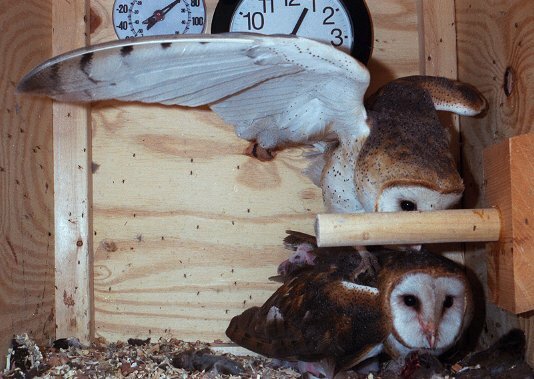 The adults land on the perch to transfer prey from their foot to their mouth before entering the box or passing the prey to a nestling in the entrance. An interior perch was also provided. I thought both adults might roost in the large box, however the male never spent the day in the box. The female was never observed using the perch until 7/29. She began roosting away from the nest box on 8/5, so the perch had limited use by her. However, during that one week, she spent a great deal of time on the perch. On 8/23, the oldest nestling began using the perch. While the interior perch seemed to be of minor value, I see no reason to omit it from future boxes. 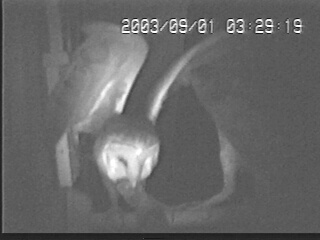 A camera with infrared lighting was mounted in the end of the box and a second camera was mounted in the top rear for a closeup view of the nest site to show both the eggs and newly hatched young. The greatest benefit of this camera during the entire nesting was the additional infrared lighting closer to the subject, giving a much brighter image from the other camera. A microphone with built in amplifier was also mounted in the top of the box. Due to the late midsummer nesting, the nest box became too hot and an exhaust fan was placed over the top vent. 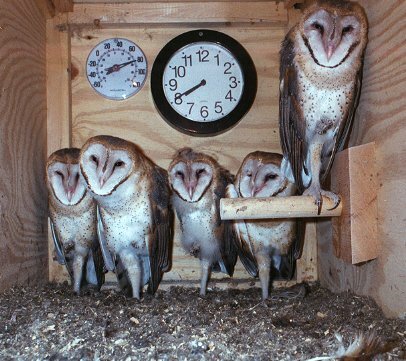 Luckily, this could easily be done in less than one minute without disturbing the owls or even opening the box lid. The exhaust fan caused cooler outside air to be drawn in through the entrance. A thermometer on the rear wall of the nest box allowed me to continually monitor the temperature from downstairs in my workshop where the video monitor and remote fan switch were located. 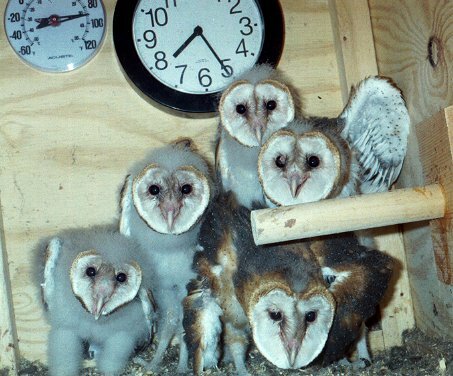 When the temperature reached 100 degrees the owlets would begin clicking their beaks, at which point, I would turn on the exhaust fan. The beak clicking would stop a few moments later. 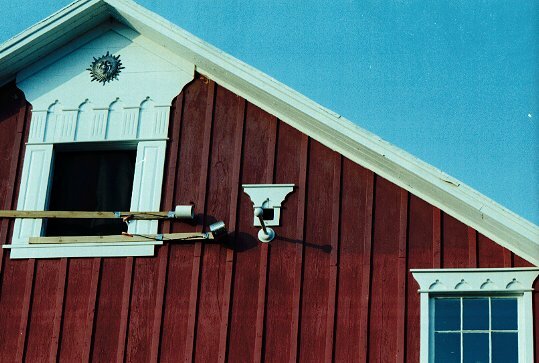 Although I had compiled temperature data at various levels in the barn before selecting the box location, I had, at the same time, replaced the seven ventilators with windows and fitted battens between the barn siding boards. This greatly increased the temperature in the upper barn on sunny days. Next year, a nest box will be placed on the opposite end of the barn, 10' lower than the present box. This location will likely not require an exhaust fan. An old motorized Nikon was mounted on the end wall of the nest box with small holes for the lens, flash head and sensor. The camera was triggered remotely from my workshop while monitoring the infrared camera. 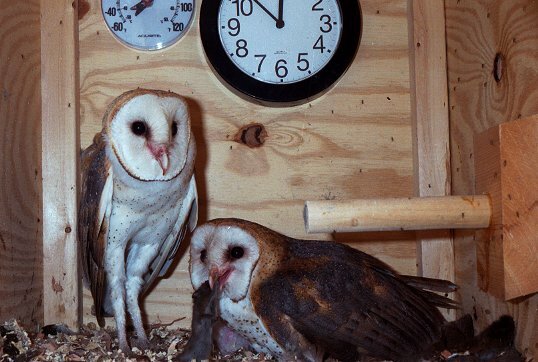 Using fast film and a low power flash, the 1/50,000 second flash duration seemed to not bother the owls at all. The camera's motor did surprise them, but was soon ignored. 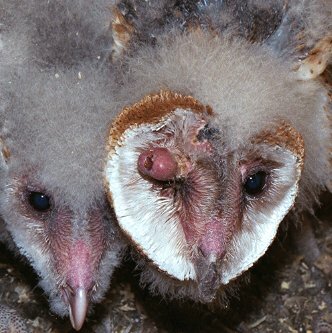 a tumor like growth with necrotic center was observed above the eye of the two older nestlings. This owlet had a second lesion at the upper edge of the facial disc. Both owls seemed to be unaffected by these growths, which slowly regressed, and may have been parasite related. a napping owlet would often appear dead in the b&w video, and then suddenly stand up, appearing bright and alert as ever, while another nestling would slump over on its side and take a nap. The older nestlings begin standing erect. Note the advanced plumage of the oldest (bending over in forground). The youngest is napping. 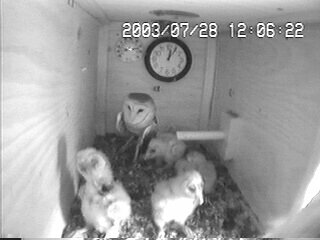 Nestlings are frightened by my fitting 35mm cam board on other end of box. The oldest owlet's plumage is developing rapidly. 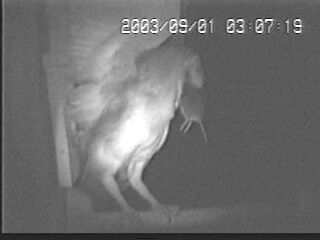 The outside prey cam mounted on the barn wall. The lower housing contains two more cameras used only to provide extra infrared illumination closer to the subject. 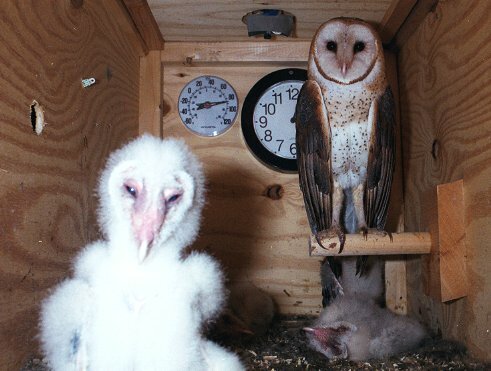 Older nestlings alarmed by my fitting the 35mm camera board. 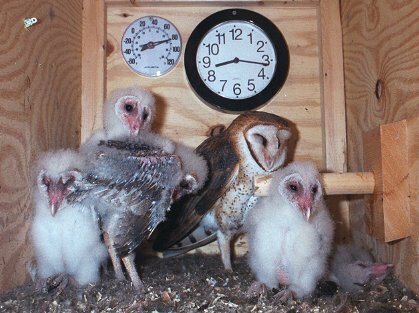 The 5 owlets, almost ready to meet the world. 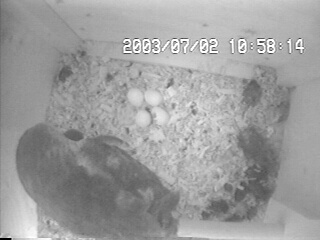 7/4/03 - top cam view - 2 eggs hatched The oldest nestling is just below the eggs and the youngest just above the eggs. 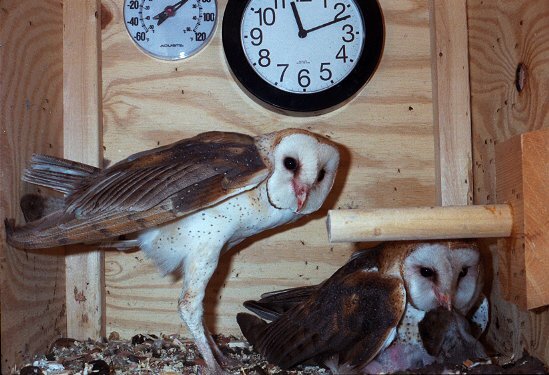 7/28/2003 - nestlings explore box while adult female looks on. 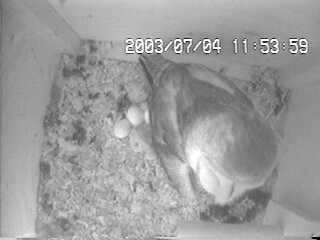 8/6/2003 - nestlings have the box to themselves now as the female roosts elsewhere. daylight view with the outside perch cam installed to better identify prey as the nestlings began to block the entrance from camera view. 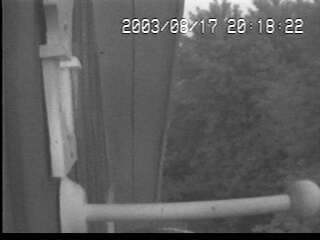 In order to view the entire perch, the camera was too far away for adequate infrared illumination, so two more cameras were mounted closer just to provide additional infrared lighting. 8/19/2003 - adult brings rat This is the only rat id'ed in the night video that I have reviewed so far. 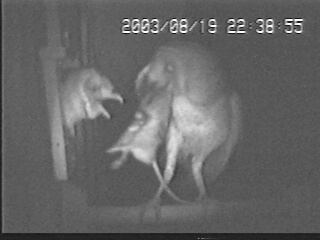 We have no stored grain and no evidence of Norway rats on our property, so we can't judge how effective barn owls are at rat control. 8/19/2003 - nestling receives rat Too bad the inside camera wasn't being taped. I'd love to see how the rat was swallowed. It wasn't in the box the next morning. 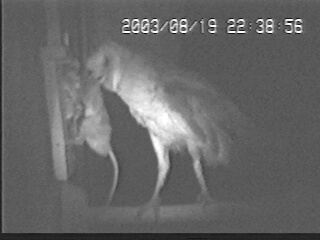 9/1/2003 - Nestling prepares to swallow vole while balancing on the perch. Since they have to throw their head back to incrementally swallow prey, this is quite a challenge for young owls. 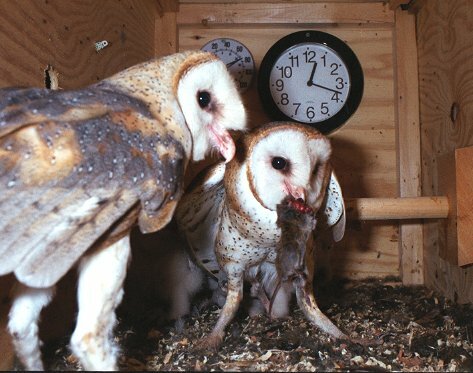 But, if the owlet tries to reenter the nest box to swallow the prey, it runs the risk of having the vole snapped away by a sibling. 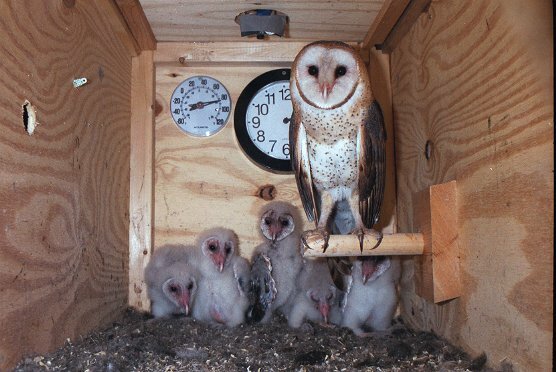 If the prey is grasped in any other position than by the head, it is impossible for the owlet to swallow and so it does reenter the box. As it acquires better balance and strength, it can stand on one leg and reposition the prey with the other. 9/3/2003 - owlets on outside perch At this stage, it seems that the older owlets must be stuffed full before the younger ones are able to compete at the entrance. 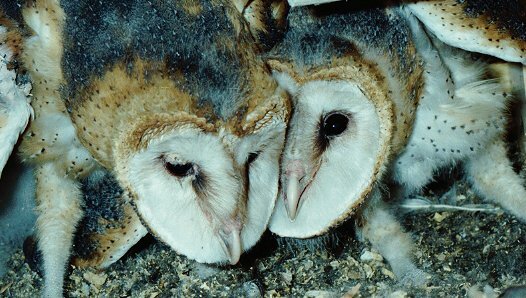 However, on several occasions, an adult has skillfully bypassed an older owlet on the perch and passed a vole to a younger one at the entrance. 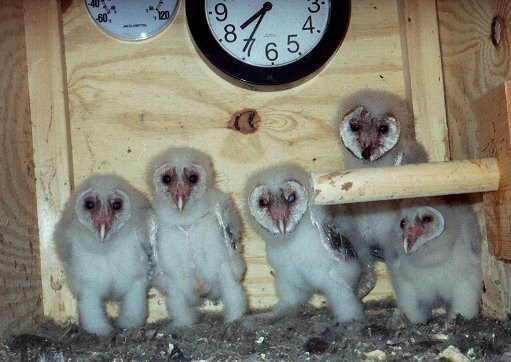 In all of the years of watching our owls, I have never seen a younger nestling starve or be eaten by it's siblings. 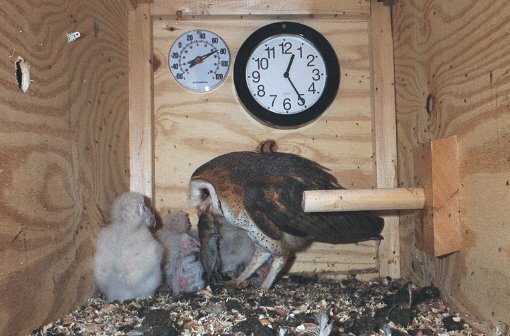 Oct 14, 2003 update While the 5 nestlings left the box to roost outdoors one by one over the course of two weeks, three have suddenly returned to the nest box to roost each day. This suggests that something went wrong with their outside day roost. I haven't noticed any mobbing by jays or crows and didn't search for their day roost, for fear of flushing them out during daylight. They spend the night in a large mulberry tree behind the barn and on the barn roof, loudly begging food as the adults continue to care for them. 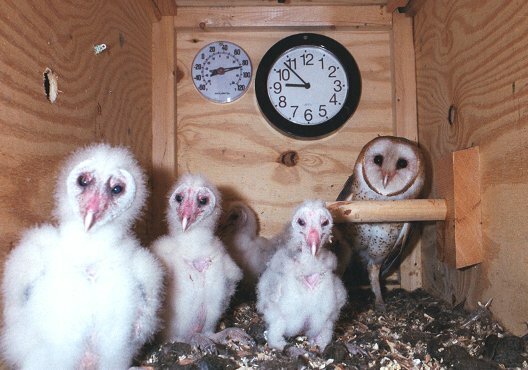 The three owls that have returned to the nest box may be the only survivors, however, I worried about the fate of the two oldest owlets earlier, when they first left the box and the third didn't leave for a week, but, suddenly all 5 reappeared in the box for two days. This is, by far, the latest nesting at this site. Usually, the young have long since been run off by mid-October and the adults defending their winter territory. One problem this year's brood may face is a scarcity of unoccupied territory since they will be seeking a home so late. 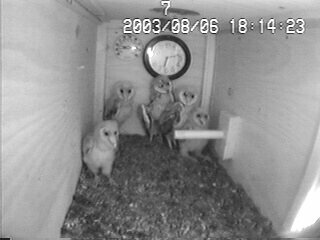 Oct 25, 2003 update The owls have finally left the box (for the second time). Two of the last three didn't return to the box on 10/19. The remaining owl spent the next two days alone in the box and left on 10/21. Also, they have not been heard begging for food in the yard for the past four nights. Did all 5 survive to this stage? Quite possibly, but I have no way to know, since I didn't try to flush them from the mulberry trees for a body count. The tree is in a fencerow of trees and if I approached from one side to flush them, they would have flown out the other side, making a count impossible. 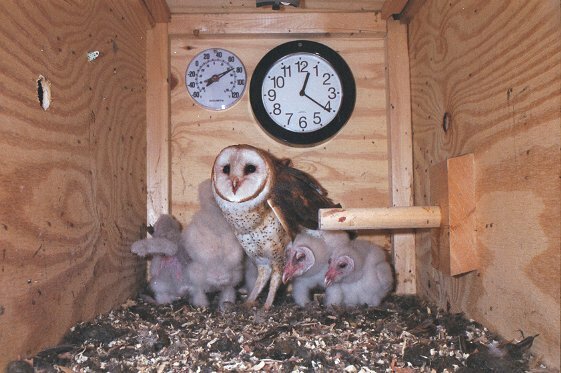 However, my role in determining their fate ended when I built and placed the nest box. 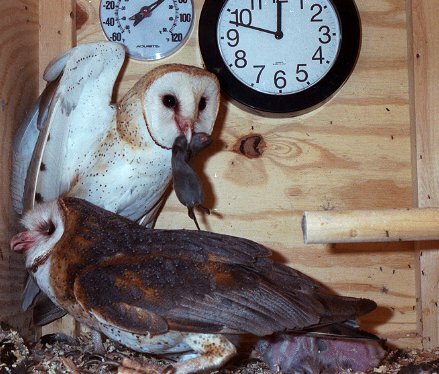 The fact that their every move in the nest box was displayed on tv in my woodworking shop and recorded on tape was irrelevant to their nesting success. But it was great entertainment during long evenings in the workshop. &COPY; 2003, 2013, American Artifacts and Richard Van Vleck, Taneytown, Maryland.